WEC 17: Halloween Fury 4 from October 14, 2005. Scott Smith vs. Tait Fletcher WEC 17 Oct 14, 2005 (10:23) In the WEC light-heavyweight tournament finals, Scott “Hands of Steel” Smith with sic of his eight wins via KO/TKO was vying for the vacant WEC light-heavyweight title against undefeated Tait Fletcher with all three of his wins via finish. 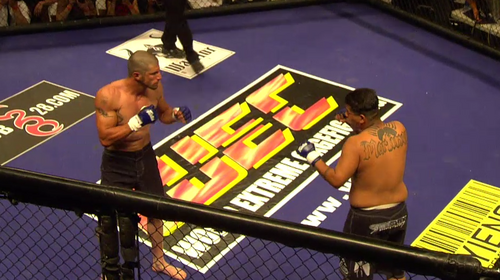 Ricco Rodriguez vs. Jimmy Ambriz WEC 17 Oct 14, 2005 (7:42) Following his bid for the WEC super heavyweight title, former UFC heavyweight champion Ricco “Suave” Rodriguez with his 18-5 pro record headed into the WEC cage to take on debuting Jimmy “The Titan” Ambriz with his 8-2-1 pro record. 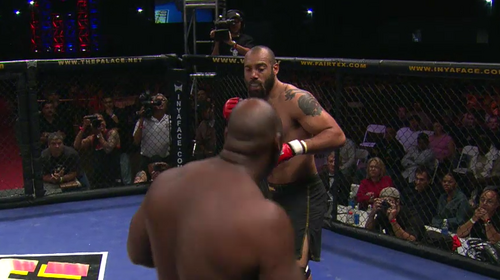 Lavar Johnson vs. Corey Salter WEC 17 Oct 14, 2005 (8:11) “Big” Lavar Johnson was on an inferno streak with seven straight wins including three first round KO/TKOs in the WEC cage. 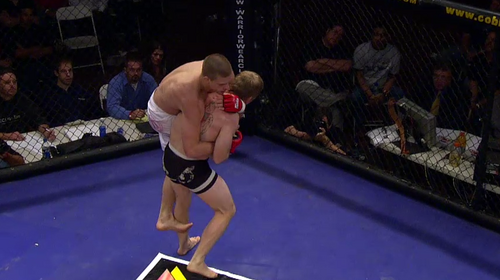 Up next, Johnson was set to tangle with debuting heavyweight submission fighter Corey Salter with his 6-3 pro record. Mike Pyle vs. Bret Bergmark WEC 17 Oct 14, 2005 (7:34) Vying for the vacant WEC welterweight title, submission ace Mike “Quicksand” Pyle who was riding a five fight win streak into his WEC debut collision with Cesar Gracie Jiu Jitsu’s undefeated Bret “The Angry Hick” Bergmark with his two TKO wins in the WEC. Gabe Ruediger vs. Sam Wells WEC 17 Oct 14, 2005 (24:14) Making his second title defense, WEC lightweight champion Gabe Ruediger was flying high on an incredible eight fight win streak with all wins by finish and was primed to take on debuting challenger Sam Wells with his 9-7 pro record. Poppies Martinez vs. Robert Breslin WEC 17 Oct 14, 2005 (7:31) Following his first career loss in his last WEC appearance, fan-favorite Poppies “The Tachi Kid” Martinez was heading into the WEC cage for the eighth time to tangle with the debuting Robert “The Bullet’ Breslin with his 2-5 pro record. Vernon White vs. Alex Stiebling WEC 17 Oct 14, 2005 (11:25) In an alternate bout for the WEC light-heavyweight tournament, submission specialist Alex Stiebling with 11 of his 17 wins via the tapping variety took on debuting Lion’s Den striker Vernon “Tiger” White who was entering his 51st pro MMA bout. 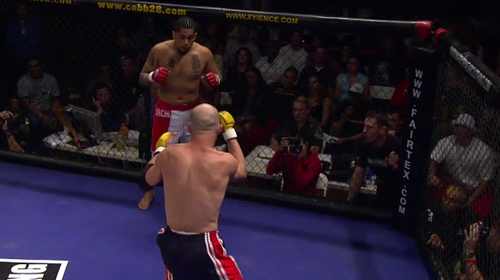 Cole Escovedo vs. Joe Martin WEC 17 Oct 14, 2005 (4:36) In a non-title bout, the first WEC featherweight champion Cole “Apache Kid” Escoved who was on a three fight win streak, all by finish, and readied for a rumble with Lion’s Den product Joe Martin with his 1-2 pro record in his WEC debut. Justin Levens vs. Jorge Oliveira WEC 17 Oct 14, 2005 (8:47) In the semifinals of the WEC light-heavyweight tournament, BJJ ace Jorge “Van Damme” Oliveira who earned a decision win in his WEC debut was set to scrap with undefeated Justin Levens who secured a rear naked choke win in his WEC debut. 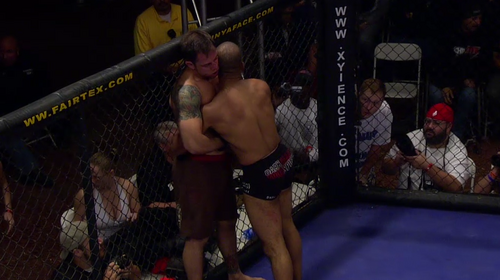 Antonio Banuelos vs. Ed Tomaselli WEC 17 Oct 14, 2005 (5:36) The PIT’s Antonio Banuelos was riding a four fight win streak including a first round rear naked choke win in his previous WEC appearance. 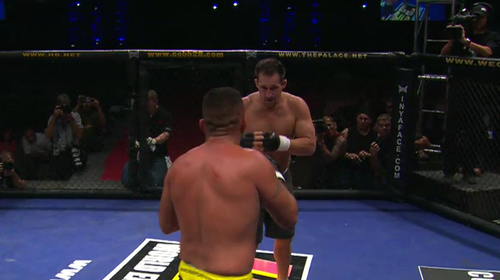 Up next, Banuelos faced debuting Ed “Tombstone” Tomaselli who was a 2-0 pro with both wins by stoppage. 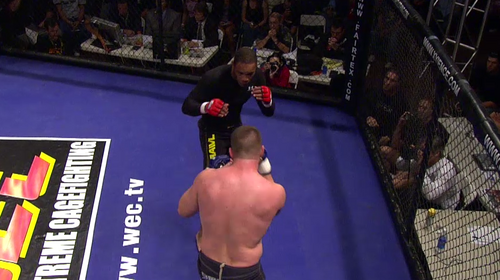 Scott Smith vs. Tim McKenzie WEC 17 Oct 14, 2005 (7:03) In the semifinals of the WEC light-heavyweight tournament, power punching Scott “Hands of Steel” Smith with his 7-1 pro record was making his WEC debut against Tim “Wrecking Machine” McKenzie with his 8-2 pro record. Gil Castillo vs. Steve Ramirez WEC 17 Oct 14, 2005 (14:12) Riding a three fight win streak, Steve Ramirez was undefeated in the WEC cage and making a big step-up in competition to square off against Cesar Gracie Fight Team product and UFC veteran Gil Castillo with his 10-4 pro record. Shane Carwin vs. Carlton Jones WEC 17 Oct 14, 2005 (6:21) Transitioning from the mat to the cage, former NCAA Division II National Champion wrestler Shane Carwin was making his pro MMA debut in a heavyweight collision against Carlton Jones, who scored a first round TKO in his WEC/pro debut. 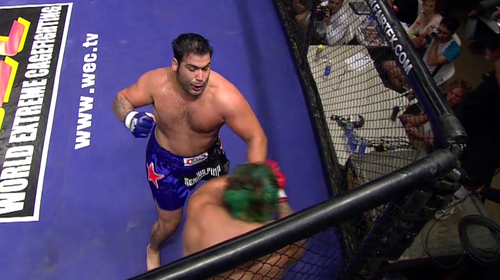 Kenny Ento vs. Charles Price WEC 17 Oct 14, 2005 (4:21) Securing a first round armbar finish in his WEC debut, Kenny “Tha’ Dragon” Ento kicked off his pro career with a big win and was ready to build on that momentum as he took on Charles Price who was making his pro MMA debut. 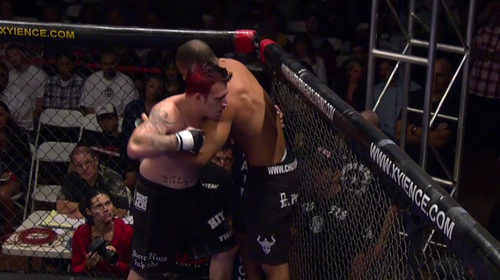 Andrew Martinez vs. Jimmy Dexter WEC 17 Oct 14, 2005 (6:22) In a WEC rookie rumble, Pacific Martial Arts product Jimmy Dexter took to the cage for a dueling pro MMA debut against Team Hard Knocks’ Andrew “Mickey D.” Martinez.